Yearbook classifieds for Canyon Springs HS yearbooks are listed below. If you want to see if others from Moreno Valley, CA high schools want to make a trade for a yearbook, post your info below. 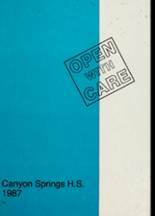 Don't forget to upload your Canyon Springs High School pictures and check on the latest info about any Canyon Springs High School reunion. Need a year book. Went up to Canyon & the front desk people were no help! Someone Stole my yearbook, or accidently took my yearbook Last couple days of Senior year 2006. If anyone has it, or can sell me one. Id be so grateful! I'm trying to locate a copy of 1998 yearbook.